- al Christmas Tree Rescue Service! Like most of you, I am oft given to spending time trying to think up ideas for making my fortune, ideas which hopefully manage to bypass the careful planning, exhaustive attention to detail, and long years of hard and dedicated work that making one's fortune usually requires. You know, the stuff you and I don't wanna do. In this time of year when legions of discarded Christmas trees sadly litter the streets of our cities and towns like so many victims of a latter day Black Plague, I chanced to happen upon the following proposed humble idea for making craploads of cash. What do you think, folks? Idea, or I-DUD? "Mommy, I'm so sad. 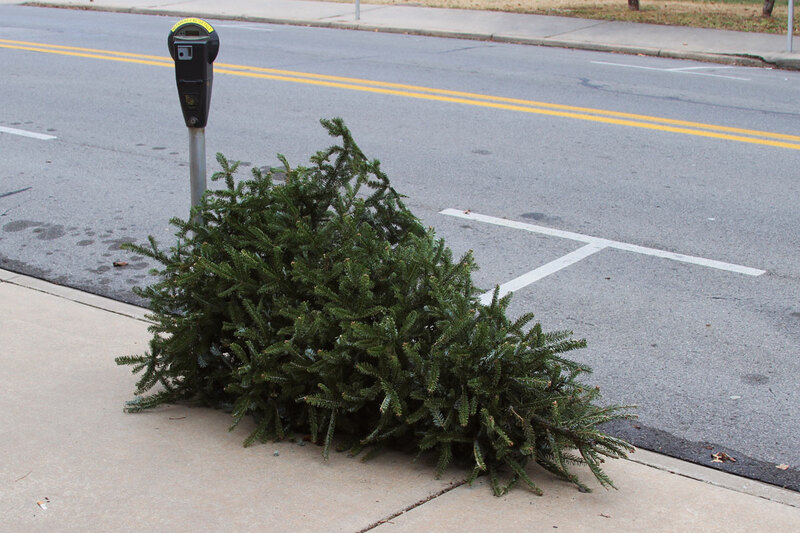 The Christmas tree's losing its needles and that always means we hafta put it out on the curb!" "Not this year, Jimmy. This year, Mommy called someone special!" "I'll bet that's him right now. Open the door, Jimmy." Magical Christmas Tree Rescue Service!" "Mommy, there's some old guy here in a ripped red sweatshirt and phony pointy elf ears." "These aren't phony elf ears, Jimmy! They're just whimsical and glued badly!" "This is the someone special I was telling you about, Jimmy! Right, Elf Perry?" "Right, Jimmy's Mom! Jimmy, I rescue used Christmas Trees and take 'em direct to Santa who breathes new life into them for next Christmas!" "How do you get 'em to Santa?" "My magical sleigh is out front. Take a look, Jimmy!" "Jimmy, please show Elf Perry where our Christmas tree is." "That would be wonderful, Jimmy, thank .... JESUS CHRIST!!! you didn't tell me you had a .... I mean GOLLY GEE WILLIKERS, you didn't tell me you had A California Redwood! for a Christmas tree." "You didn't ask, Elf Perry." "Well, let me just come around back of the tree here and, oh, oh, oh my God!!" "Sure hope you're insured, Elf Perry." "I'm afraid my business plan isn't quite that far along yet." "Know what, Mommy? I like Elf Perry, he's funny!" "Well, Elf Perry, looks like you've made a conquest." "And how about Jimmy's Mom? Y' know, you're not half bad and your son likes me, so maybe after I get done, we two could ..."
So that's Elf Perry's Magical Christmas Tree Rescue Service for you, folks. What do you think? What do you mean, I-DUNCE?!! P.S. So who says you can't do slapstick in a blog post? The slapstick worked for me. Jimmy's mom didn't seem very receptive though. Maybe it was the pick up line, "you're not half bad," that turned her off. You need to work on that elfin' charm, maybe offer her some of those elf cookies. I think I'm going to need "elf brownies" to work on Jimmy's mom, and lots of them. And yeah, my pick up lines are a bit rusty but frankly they didn't work that well during the Carter Administration either. The only problem with slapstick in a blog post is that I'm still trying to figure out how to do a decent spit take. And how the hell do you throw a pie? Thanks for writing, Russell. Getting comments on non-flash fiction posts makes me feel oddly popular, but I won't let it go to my head.